Millions of dollars for a losing team again? The 2008-9 basketball season began a few days ago with the Knicks beating the Miami Heat 120-115 in the coaching debut of Mike D'Antoni. Tonight they reverted to last year's form by losing to the Philadelphia 76ers 116-87. They made only one significant move by signing free agent Chris Duhon. They couldn't make trades because other teams would not pay the salaries of players like Stephon Marbury and Zach Randolph. Marbury is being paid about $22 million this season for just sitting on the bench. People in all walks of life work long hours to make a living for their family and this guy gets big bucks for doing nothing. Go figure. The tickets were supposed to go on sale at 10 AM on Ticketmaster. I tried for about 40 minutes at home, but I had to get ready to go to work. I thought the system may be jammed with people trying to get through. Anyway, I thought I would give it one more try when I arrived at work at 1 PM. Sure enough, I was able to get 3 tickets. The base cost was $59 each but then Ticketmaster has to get in the act and add surcharges. There is usually an option for them to send the tickets via postal mail, but this time they have to send the tickets via UPS for an extra $12. There is nothing we can do about this. Also, why does Ticketmaster use UPS instead of FedEx? 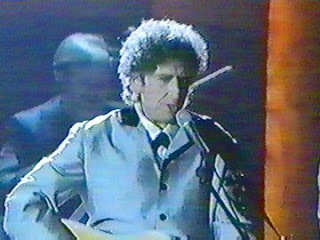 Bob Dylan and his Band will perform a special show exclusively for readers of bobdylan.com on November 21, 2008 at the United Palace Theatre in New York City. This theater is located in Washington Heights in upper Manhattan. I hope the tickets which will go on sale this Thursday morning will not be too expensive. My son Lee and my friend Herb were both born on March 28th, obviously in different years. They both share a passion for the New York City Subway system. When Lee woke up this morning he reminded me that the subway first opened on October 27, 1904. 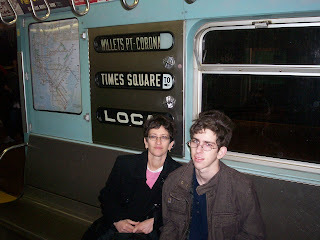 Since he was a little boy Lee always carried maps of the subway system whenever we went somewhere by train. If you need directions, just ask him. The photo above is of Lee and Karen last winter at the Tranist Museum in Brooklyn. They are sitting on a #7 train as it was in 1964 for the opening of the World's Fair and Shea Stadium. What a difference a day makes with the weather. 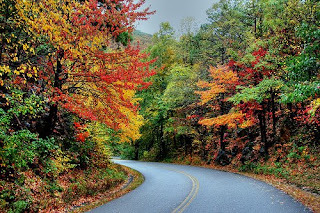 It was a rainy nasty day yesterday, but today was as good as in gets in late October. I took Lee down this morning to play basketball in the P.S. 214 schoolyard just a block away from home. Lee then met his Samuel Field Y group for a trip out on Long Island to pick pumpkins. I then drove out to Douglaston to walk around Little Neck Bay as I have done many times before. When I got home I surfed the web as I listened to Sounds of the Sixties with Brian Matthew. If you remember my AOL journal there was always an entry for music that you listen to while you write a journal entry. Afterward I walked to downtown Flushing to Modells to buy a pair of sneakers. 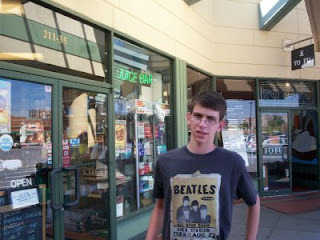 I saw a nice t-shirt commemorating Yankee Stadium in its last year. I decided to buy it for Lee since I already have a Shea Stadium shirt. It will also be sad to see Yankee Stadium (1923-2008) demolished. Karen stayed home and cleaned out some stuff we had collected over the years. She found some photos from my Dad when he was in the army during World War II. Rdio enthusiast Rich Appel writes a column called Hz So Good for a newsletter called Decalcomania. He is asking people to vote for their 25 favorite radio personalities which may be disk jockeys or talk radio hosts. You may e-mail him your choices at audiot.savant@verizon.net by November 11. Here are my choices in no particular order. I numbered the entries to make sure I limited my choices to 25. We had a choice of two college football games today at CW Post or Hofstra, but the weather was bad. Nobody wants to sit out in the in rain watching a game, so we headed over to the local multiplex. According to the newspaper W, the movie about our beloved president was supposed to start at 1 PM. When we got to theater we were told that its first show was not until 4 PM. Apparently the movie listings in the newspaper was wrong. Instead, we saw the Secret Life of Bees starring Dakota Fanning and Queen Latifa. We enjoyed it. The weather is supposed to be nice tommorow. I can't watch Shea Stadium being deconstructed so I look the other way on the #7 Train. Is there anything else for the good of the order? Is there anything interesting on dave DuBrow's wall on Facebook? Saturday Night Oldies on October 25th will only be 30 minutes, so I'll watch the World Series. The Knicks season begins next week with their new coach. We will have to paint our apartment within the next few months. I just can't stand people who constantly repeat themselves. Life is always a series of endings and new beginnings. After the World Series the Mets will begin to make player moves. I will pick my table very carefully at the next event in 44 days. I have been getting significantly less e-mail lately. You have to be grateful to have a job these days. Anyway, my question to readers of this journal - Which of the above has become my favorite Yiddish expression over the past two years? It is very hard to pick my favorite songs. WCBS-FM does this all the time. I always vote for songs that are consistant with their format. The board moderators of the Oldies Message Board are now running a vote for the Top 77 hits of all time. Just for the heck of it I vote, but these surveys don't prove anything. I picked 7 songs including Bob Dylan's Like A Rolling Stone, but on another night I could pick another 7. I wouldn't vote for Maggies Farm or Gotta Serve Someone, Forever Young, or Tonight I'll Be Staying Here with you since they were never played on Top 40 Radio. I'd like to thank Mike Riccio, Tom Natoli and Bob Radil for their efforts. They will play the list on December 26th at 6 PM on radio station WNHU - New Haven which can also be heard on http://www.wnhu.net . Likely Hey Jude by the Beatles will be number one. As I mentioned before in this journal, if I enjoy a song I don't care what number it is. I think my mother was the most thrilled since both of her children celebrated their 25th anniversaries this year. It is sad that my Dad didn't live to see it. Does Mom look 89 years old? 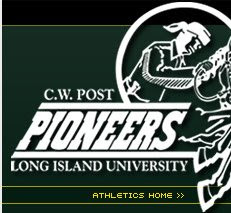 Today we took a drive to the CW Post Campus of Long Island University to see a football game. When we arrived the parking lot was much more crowded than usually with many tailgate parties. This was their homecoming weekend. CW Post beat Millersville University 55-38. This is Division II football so the quality of play is obviously lower, but at $5/ticket how could we go wrong. As we left there will still plenty of people partying in the parking lot. It seems that they were not at all interested in the game. 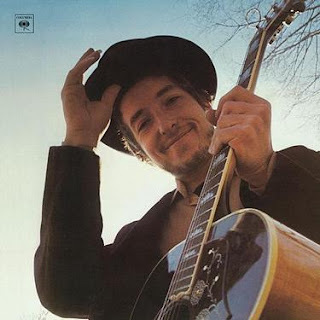 Back in 1969 Bob Dylan released Nashville Skyline, a collection of country songs. I remember one of the reviews of that Album which said "that angry young kid got romantic" So here it is "Tonight I'll be Staying Here with You." And point away from the past,I'll bid farewell and be down the line. Bob Sang this song on November 19, 1995 at a TV special to honor the 80th birthday of Frank Sinatra. I always remember the line in the film "Masked and Anonymous" - his songs are so vague and open to interpretation. As I look at the lyrics I must thing of that poor guy in a tie dyed t-shirt who really needs help. Karen and I went out for breakfast this morning. I will be working on the late shift tonight. Our main celebration will be on Sunday. Let me recall the wedding. It was a Sunday afternoon affair at the Old Westbury Hebrew Congregation on Long Island. From 10 Am until about 12 noon we took photos. The smorgesboard started about 12 noon with the ceremony at 1 PM. I don't have any wedding pictures digitized. We had about 150 people at the reception. We had a live band that featured Beatles music. Karen picked out the wedding son which was Endless Love as done by Diana Ross and Lionel Richie. If I was going to pick a Dylan song it would be Tonight I'll be Staying Here with You. The reception ended about 5 PM. The next morning we left for our honeymoon in Hawaii. Where did all these years go. If it came before the wedding we would have played it at the reception. Several months later WYNY dropped the show. I wrote a letter to the producer asking her to get another New York station to carry it. She wrote back saying that the show was going to be cancelled in a few more weeks anyway. She sent us three records with the show. Back then the syndicator would mail or FedEx (Hi Dave) the show to the radio stations. Now the shows would be sent over the Internet. Last June I devoted a journal entry to WFUV. Twice a year they have fundraising drives. This morning I accessed http://WFUV.org where there was an announcement that if one donated today, an anonymous person would match that donation. Since I would have given money to them during the drive, I decided to do it today so that my donation would be matched. I will get 2 CDs from the station. 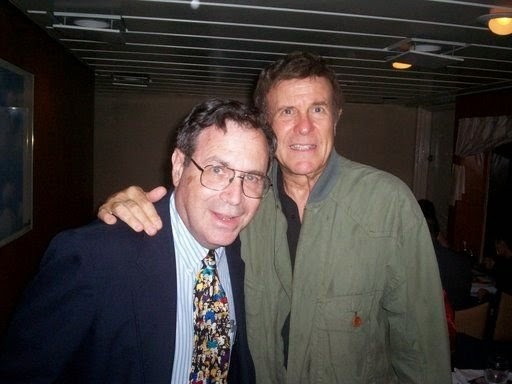 WFUV was really a life saver during the two years when WCBS-FM was hijacked. They also offer students some experience working at a radio station. During the winter I will donate to WBGO, the not for profit jazz station. 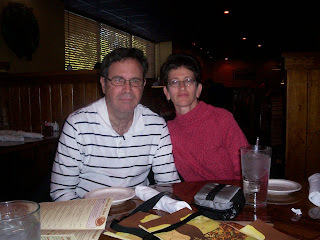 Here is my second journal entry in honor of Karen and my 25th Wedding Anniversary.Lee, this is how it met your mother. Let’s go back in time to July 1980. 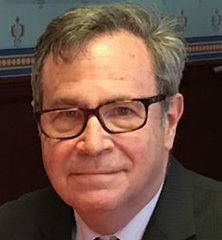 In one of my earlier journal entries I talked about how I was active in Queens B’nai Brith Singles and how the members were using the group as a substitute for dating. Back then I was working for Schering Corporation in Bloomfield, NJ. Even, back then it was a long commute from Queens to NJ, but I told everyone that living in NYC was a better option for a single person than living in the suburbs. 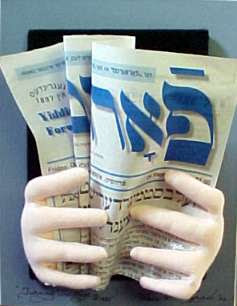 Personal ads were becoming an acceptable way of finding dates. I never placed an ad, but answered a few from a newspaper called the New York Almanac. One night I received a phoned called from Lynn who said she lived in Bloomfield. Obviously that was a conversation piece. We agreed to meet for a date after work one day. Most of my co-workers at Schering were a bunch of middle aged women who had to gossip about everybody and anybody. I always told them that there were more dating prospects in New York than New Jersey. When I told them that I had a date with a girl in Bloomfield within walking distance I heard a very loud laugh. I enjoyed the date with her; it certainly takes more than one meeting to get to know someone. Anyway, when I came back to work the next Monday, they ambushed me asking how it went. I asked Lynn out for a second date. We agreed to meet on a Friday night just after work. I said I would phone her when I left work to set the exact time. I phoned her home and got no answer. I tried 15 minutes later and still no answer. I then decided to go over to her apartment. I rang the bell and she answered. She said I just don’t feel like going out. I was stood up. How rude can one be? She could have declined my invitation for a second date, but don’t stand anyone up. That was the first and only time that happened in all of my years of dating. Monday morning, the busy bodies ambushed me again as I told them I was stood up. Arlene Shapiro was another co-worker who was married Jewish woman a few years younger than I. About a month later, she asked me if I’d like to meet her sister-in-law who lived in Queens near me. I figured that after being stood up the last time I had nothing to lose. I met Karen on August 30, 1980. Our first date was at an ice dancing show at the Nassau Coliseum. I remember that as she locked the door to her apartment, I thought, I am ahead of the last time. When we talked, we both found out we both liked the Beatles. 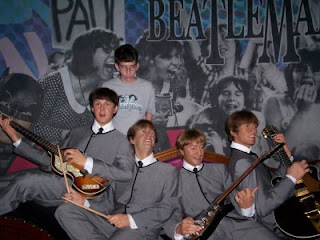 So, it is safe to say that the Beatles brought us together. I didn’t introduce her to Bob Dylan until later, but I did notice she had the album Blood on the Tracks in her collection. I also remember that when we got back to her apartment that Saturday night she turned on the radio to 99-X. Later on we turned on WCBS-FM and listened to the Sock Hop with Jack Spector. After the second date, she invited me to her apartment on a week night to listen to the Beatles. The rest is history. 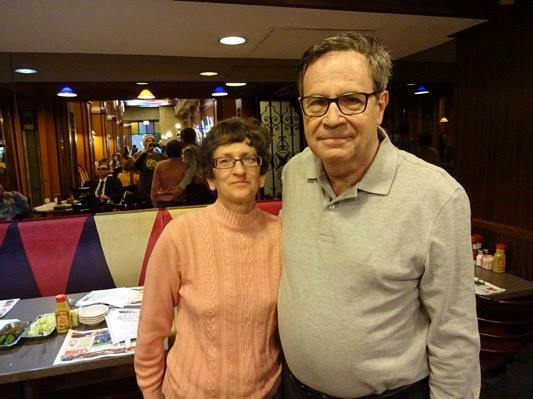 Postscript – Paul (Karen’s brother) and Arlene Shapiro were divorced about 5 years ago. They have both remarried. 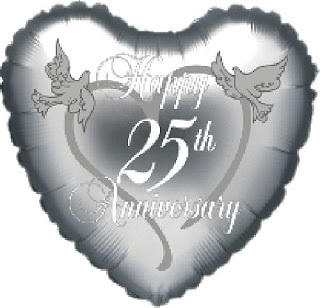 This Thursday October 16th will be Karen and my 25th wedding anniversary. Before I talk about that let me recall my parents 25th anniversary. They were married September 8, 1946 so their 25th was in 1971. I was a 22 year old student at City College while my sister Joyce was an 18 year old student at that time. We chipped in with my Aunt Belle to have a surpise party for them at Caesar's Restaurant in Rego Park. There were about 30 people there. My folks were really surprised. They had no inkling that we were planning anything since we did it in August. I remember one of my father's friends Willie, had a little bit too much to drink, so I had to drive him home. I have enjoyed specialty radio programming since the 1980s. One such show never heard in the New York radio market is the Lost 45s with Barry Scott. Please check the link for more information. For most of its run it has been heard on several Boston radio stations. Back in the 1990s I used to trade dubs of my radio airchecks for tapes of that show. Today it is heard on WODS Boston which can be heard on the internet Sundays from 7 - 11 PM. You can access that station from http://radio.aol.com by looking for oldies 103.3 from Boston. You can buy CDs, books, and other items from the show's web site . There is also an online version that can be heard 24/7. Check it out sometime. On February 17, 2009 TV as we've known it for over 60 years will change. Viewers will no longer be able to receive analog VHF and UHF stations. I would guess that at least 80% of all TV homes have either cable or satellite television and won't have to worry about converting. We have subscribed to Time-Warner cable TV for many years on one TV in the living room. We have a small secondary TV in the bedroom which we don't use very much. Rather than pay extra for another cable TV subscription, we decided to buy the digital converter as outlined in http://www.dtv2009.gov/ . If you go to that web site you can get a coupon to save $40 on the purchase of the converter. Since we had a little time today after we saw the movie The Express, we purchased it at Office Depot. We won't need it until February anyway. In the Fall and in the Spring each year we take a walk around Rockaway Beach. We park around Beach 96th Street and walk to the business district on Beach 116th Street and eat lunch. 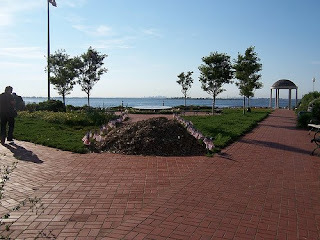 Today we discovered by 116th street and Jamaica Bay a memorial to the victims of September 11th. See the top photo. 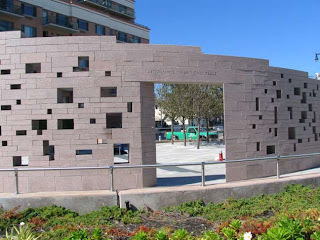 When we walked back to boardwalk there was another memorial for the victims of Flight 587 which crashed nearby in November 2001. This is the second photo. 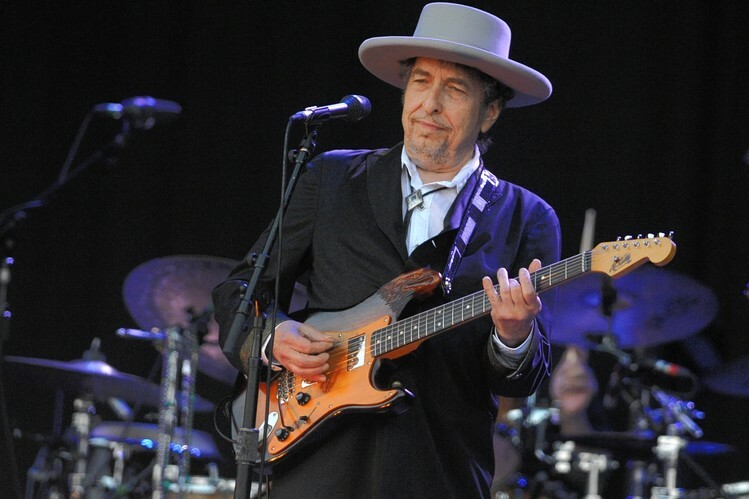 This week Theme time Radio Hour hosted by Bob Dylan returned to XM Radio for a third season. For this week the theme is money. I can listen to the show since I subscribe to the online version of XM Radio, but I download it from a devoted listener. Dylan picks obscure songs from many genres of music. Today AOL gave instructions on how to upload all information from AOL Journals which will end at the end of October to Blogger. All my posts from the past 3 years have been moved from http://journals.aol.com/bruces8852/BrucesJournal/ to http://bigtownman.blogspot.com . This journal will be devoted to peronal issues. 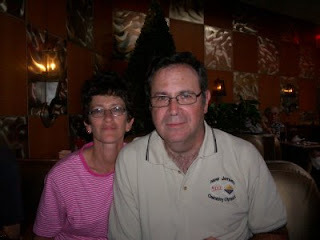 My journal on work related issues that I began last August remains at http://njitbruce.blogspot.com . Feel free to comment at both places. On Rosh Ha Sha Na it is written, on Yom Kippur it is sealed. May you have an easy fast if your chose to do so. My best wishes for a happy, healthy, and peaceful year for all. There used to be so many places to buy records, tapes, and CDs, but the music store is quickly becoming a dinosaur. I could have purchased this new Dylan CD through amazon.com or other electronic retailer, but I decided to try to relive the thrill of running to a music store to buy a new release of a major artist. There is a Borders right outside Penn Station, so I bought the 2-CD set on the way home today. Most of it is alternative versions of tracks that were originally released from 1989-2006. This is not my favorite Dylan period, but I enjoyed it. I did get a chance to listen to it while it was streamed for free on http://npr.org . Tonight I was able to listen to the first CD. Hopefully I'll have time to listen to CD #2 tomorrow when I get home from work and before the start of Yom Kippur. Today was one of those days that I wish I lived across the street from work. I got on the #7 Flushing train as usual, but it stopped near the 74th Street stop since the power was cut off. Since the back half of the train did not make it into the station, we were told to walk to the front of the train. Luckily at 74th Street, I could transfer to the E train which also goes to Penn Station. I got on the 8:12 New Jersey Transit train which was delayed an additional 10 minutes. I got to work 40 minutes late. On the way home the New Jersey Transit train was 15 minutes late. Tomorrow will be a better day. Today as I was driving I wanted to make a right turn, but I saw an elderly man with a cane walking slowly across the street. I obviously stopped to let him cross, but some jerk behind me honked his horn. How insensitive can you get? I wonder who are worse drivers or riders of mass transit? Are radio traffic reports reliable? Lee and I drove to Cunningham Park this morning and arrived home about 10 AM. We got off the Whitestone Expressway at the Linden Place exit as usual. After I parked the car I noticed a big traffic jam leading to the Whitestone Bridge. I thought that there must be an accident there since construction delays are not that bad. Whe I got to the aprtment I turned on WCBS-AM to hear if there were any explanation of this jam on the traffic reports on the 8s. I heard of other tieups in the NYC area, but nothing about the Whitestone Expressway. My question is how reliable are radio traffic reports? Drivers would listen to them to try to get to an alternate route if they hear of a delay in their area. I assume that there must be a lag time between the development of a traffic jam and its report on the radio. This morning I was sleeping when the clock radio went off. This is very unusual for me. Anyway when I woke up a was dreaming about a pizza with several toppings on it. I guess it was just another crazy dream. I have not yet recived instructions from AOL on how to transition this journal to another blogging service. I would hate to lose my entries over the last 3 years. There is just too much to move manually. I put a counter on my work related journal. I want to get an idea of how many people are visiting. Only one person has commented there. I was thinking about commenting about Michael Bloomberg and Sarah Palin, but I think I'll keep politics out of this journal.